The windmill would not rotate properly... just a little bit and stop. So I took it apart to see if I could find anything wrong. It has one of those rubber "driving washers" like on a 3520 or 3620 Searchlight Car, but this one only has three nubs instead of the six like the Searchlight Car. I suspect this is the problem, similar to the searchlight not rotating. I had one spare (with 6 nubs), so figured I would try replacing the original with it. Came apart easy enough with just a couple of screws, but the brass fitting at the base of the windmill assembly just dropped out. So now I'm not exactly sure where or how the loose unconnected wire is suppose to be. I suspect that the loose wire just lays underneath the brass fitting where that fits onto the vertical windmill shaft ? I can't see where else it would go. 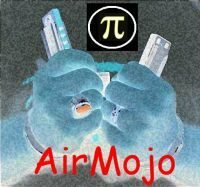 I uploaded a couple of photos. I re-assembled it the way I thought.. with the bare part of the loose wire under the brass fitting. The motor was working, but I still could not get the windmill to turn... it would nudge a bit , but that was all. I dissassembed it a few times, cleaning the brass rod that connects to the windmill blades, and the end that goes into the motor, and the little washer... and applied some graphite. But then the little brass contact with the bare thin hair-like wire broke loose... I hate those thin little wires ! So now I have to resolder the wire back onto the brass contact. I'll see how that goes ! First I have seen one of those. Will be neat to see a video of it running once you get it going. I agree... I've spent way too much time on this to try and get it to work properly. 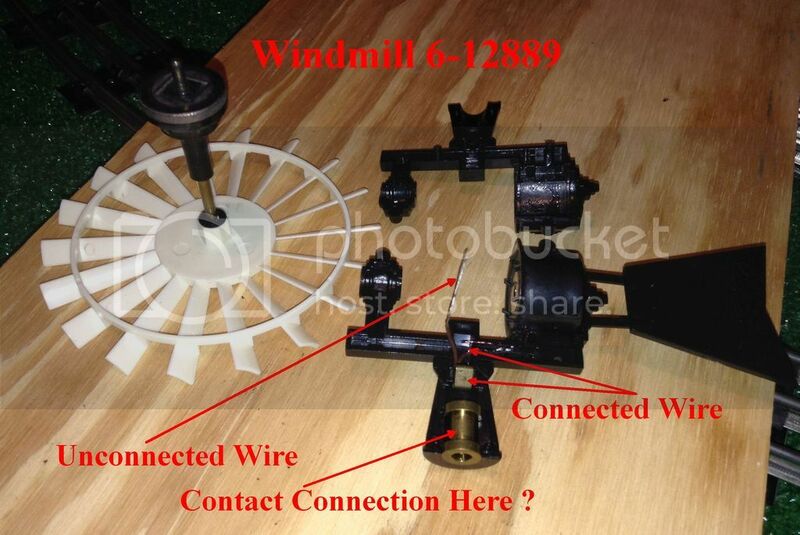 Is there an old post-war windmill out there worth getting that's made to actually work, and easy to make work again ? I am looking forward to going to some Train Shows in the Cleveland, Pittsburgh areas, like I used to do ! Looking for the old stuff that actually works and can be fixed fairly easily ! Michael6268... Do you know which way the thick metal washer with the square center cut-out that rests against the rubber finger washer goes ? One side is flat & the other has a circular indention... I tried it both ways, but did not seem to make any difference getting the windmill to rotate. KRM... I found this very brief YouTube video that shows it operating... he replaced the 3-fingered rubber washer with a 6-fingered rubber washer. I just re-read his description comments... he said that he did NOT use glue on the replacement rubber fingered washer. I did clean all the parts with alcohol, but then used some graphite (as recommended in the Lionel document that came with the windmill) to lubricate and try and get the windmill to rotate. Looks like I will be taking it apart again ! That's a good question. I took mine apart as you did and at one point forgot which way it goes. I'm almost positive it was originally with the bigger flat side towards the rubber finger washer. But as you I've tried, ive done both ways and it doesn't help either way. The problem I found with graphite is the washer is in a vertical position, therefore the graphite really doesn't stay on the washer. It just falls out. I just got done taking it all apart again, removed the rubber washer, scraped & cleaned the glue residue off of it and the motor, then cleaned all the parts with alcohol, and reassembled it. I did put that thick metal washer with the flat side toward the rubber washer. The windmill actually does rotate a little, but still hesitates and stops a bit. Now I am wondering if the brass shaft that the white windmill blades part pressure fits to may need adjusted a bit, one way or the other ? I'm going to give that a try. See the photo where it fits tight into the black plastic housing. I know it's an old thread, but I was wondering if you ever got it working right? Mine just stopped and I think it's because the "3 fingered" washer has only two now. One must have worn off. Dr Joe... no, I never got it to work smoothly... the windmill will turn some and hesitate, and a slight rotation around the shaft. I would definitely try replacing the rubber fingered washer to see if that helps. Lubrication may be an issue, but like I said in a previous post, the recommended graphite, just falls out. I think it really helps to try and get the graphite into the areas where the brass shaft rotates... up at the windmill end, and up where the brass shaft goes through the rubber finger washer. Apply a little in each area and rotate the brass shaft a bit... see how it rotates when turned on... apply a little more, and try again. Mine seems to rotate better this way, although it still hesitates some. 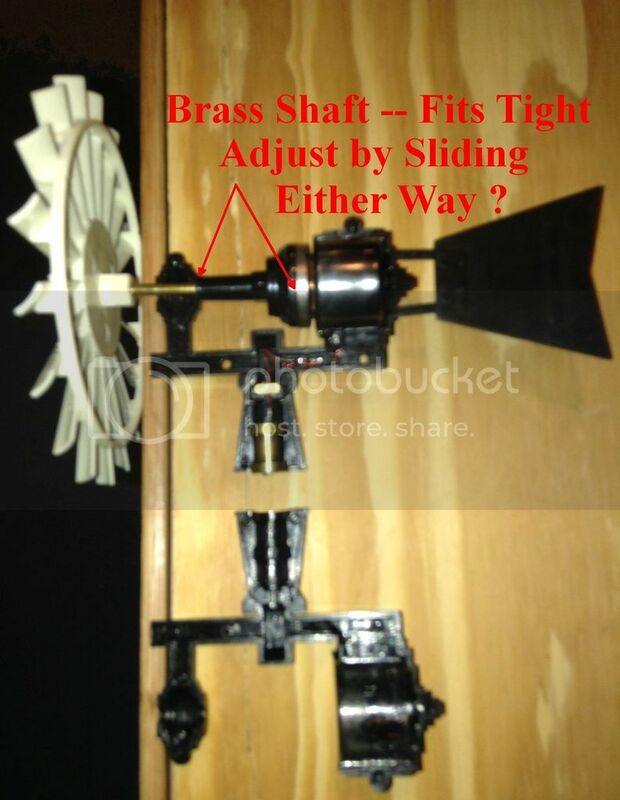 I may try disassembling it again, polishing the brass shaft, and burnishing a little moly paste in the shaft and areas that it rubs on the black plastic area around where the shaft rotates.